Because I haven't posted in awhile, you might think that I haven't been hacking, but I assure you that is not the case! Between the Facebook Platform and the iPhone, there are many new opportunities to explore lately. Nevertheless, my most recent (published) work is still related to my favorite product! Also, since school is back in session, Mike Lambert and I updated mitcalendars.com with links to all of the Fall 2007 MIT course schedules hosted on wikicalendars.com. Sadly, wikicalendars.com has not taken off as we had hoped (it does get a lot of spam, though! ), but if we ever have time to make it as easy to add events to wikicalendars.com as it is to add events to Google Calendar, then I think we'll do a lot better. Oh! And unfortunately I missed Google Developer Day this year because I was too busy working on the Google Calendar gallery, so I didn't have a chance to comment on mapplets, which are really cool! With a few PHP includes, I was able to turn CalMap into a mapplet. I'm sure you can do the same with your own Maps mashups, so give it a try! Facebook recently announced that it has dramatically expanded its API to allow deep integration into facebook.com, aptly naming the project Facebook Platform. The potential integration points for a Facebook Application look very appealing, but developing for the Platform itself still seems a bit rough around the edges. On the Platform Wiki, I found a link to an external tutorial on creating apps with canvas pages which seemed promising, but it also addressed authentication issues and required me to download some PHP code, neither of which I was particularly interested in (this seemed like overkill just to embed an IFRAME), so I moved on. Now that that was out of the way, I tried to wrap my head around the difference between a URL for my web site and a Facebook canvas URL. Apparently, you get some namespace under http://apps.facebook.com/example.com/ which maps to real URLs on your own domain, such as http://example.com/facebook/. The developer has to keep track of this mapping himself, so when asked for something such as the Side Nav URL, you need to supply the apps.facebook URL instead of the one from your own domain. Why isn't this mapping done automatically? Why can't I use the URLs that I already know instead of the ones that Facebook invented for me? There's also something strange about the role of your Callback URL (or is it "Url?"). I tried to use the authentication overview link to learn about it, but that page (http://mit.facebook.com/developers/documentation.php?doc=auth) gave me a 404. Fortunately, there is some information on the wiki about the callback page -- it seems that is serves both as your login handler as well as your home page, which I suppose works out all right if you're authenticating users' Facebook tokens, but if you just want to show a static page, there isn't much point. Finally, Facebook appears to be finicky about using explicit URLs (perhaps it's a security thing? ), so using http://example.com/facebook/ as your Side Nav URL is automatically converted to http://example.com/facebook/index.html even if your Apache DirectoryIndex directive points to something else. For a site who probably has its DirectoryIndex set to index.php, I find this a bit surprising. As you can imagine, I spent quite a bit of time playing around with the Edit page, as I imagine most new developers do. It would be really nice if the Save button were an Apply button instead that applied the changes without reloading the page since there's a good chance that the URL that you just entered was the wrong one, so you're going to have to return to the Edit page again, anyway. In the coming weeks, I'm sure we'll see a number of these issues get cleaned up (as well as adding *cough* search *cough* to the Application Directory) -- you never really know what bugs your API has until developers start using it. I trust that the Facebook developers were working very hard to get the platform ready for F8, but their job is certainly not done -- no rest for the weary, kids! And if Calendar isn't your thing, then I recommend trying out Google Reader (http://reader.google.com/) with Your Page Here. Thanks to Chris McAndrew for suggesting this hack to iGoogle. Another possibility is writing an XPCOM object in a language other than C++. I started to explore PyXPCOM for writing modules in Python, but got discouraged when I discovered that Brendan Eich himself commented that PyXPCOM does not make it practical to write Firefox extensions in Python because it requires bundling Python with the extension. I'm guessing that the XPCOM language bindings for Perl, Ruby, and Java have similar limitations. Though I am likely going to pursue the Java path to make this happen, I think it would be great if someone with the right know-how created a C++ XPCOM object that exposed a scriptable interface that would let you connect to a Jabber server (using TLS) and provide access to input and output streams for that socket. If anyone knows his way around the GAIM code, he or she could likely leverage what is already there to make this happen. 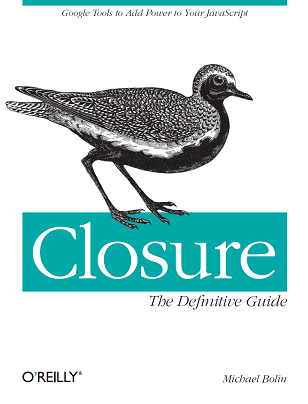 I expect the "plumbing" involved in bringing in the existing C++ code, creating the IDL, and compiling for the major platforms, is likely where more than 80% of the work is – the new code that needs to be written should be fairly minimal. For the end-user, this would provide the best experience since he would be able to install a Firefox extension without having to install the Java plugin on top of it. Also, the C++ XPCOM object would likely be faster, because in developing Chickenfoot, I learned that crossing the Java/C++ process boundary can be expensive. (This is described in section 8.1.1 of my thesis.) So if anyone is interested in taking on this project, or if you know of an existing solution, then please let me know! I wrote a Chickenfoot script to generate the 2007 Major League Baseball schedules from mlb.com. 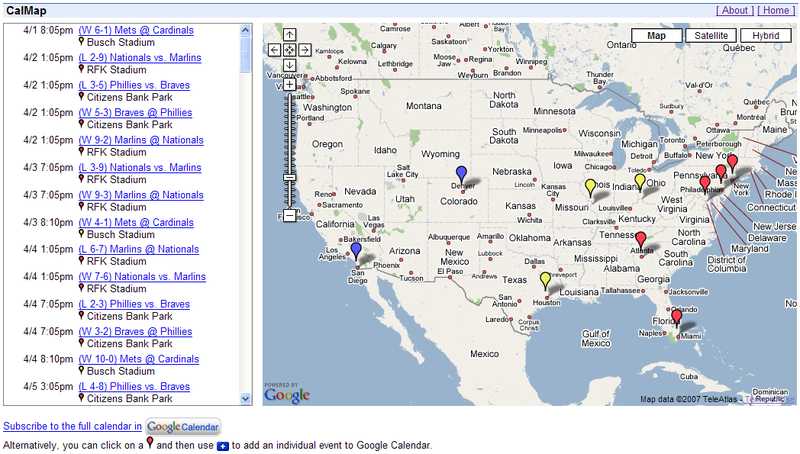 Instead of putting the schedules directly into Google Calendar, I posted them on wikicalendars.com. Just visit the site, click on your favorite team (let's go Mets! ), and click on the "Google Calendar" button above the calendar preview to add the schedule to your Calendar account (or click the iCal icon to add it to Apple iCal). Students could not update or correct the calendars we had auto-generated. We had to guess which permutations of calendars for a course we should generate: if there are 2 lecture choices , 8 recitation choices, and 3 lab choices, should we generate 48 calendars for the course? How do we present all 48 options a to user? To address the first issue, we decided to store the calendar data in a wiki so that anyone on the web could update it. This way, if a class were rescheduled, or if a final exam were added, anyone from the class could adjust the course's calendar accordingly. Obviously spam would be a concern, so we decided to go with the ever-popular MediaWiki, since we assumed that Wikipedia has more experience with spam than anyone, so they likely have the best tools to combat it. Also, because it was open-source, it was easy for Mike and I to hack it up as we needed. Unfortunately, unlike WikiMedia's wiki-language, our format strongly favors English speakers -- especially those who use American date and time formats. Though we were not thrilled with this decision, we felt it was acceptable for our first version of the site. We tried to focus on simplicity, and I think many will agree that 4/1/2007 8:05pm is much simpler for the average person to work with than 200704012005/200704012305. The calendar syntax is documented in detail on the web site. So given all of this, what makes a good wikicalendar? Arguably, any calendar whose events come from a community of people rather than from one well-defined leader. For example, I started a calendar for release dates of Wii games which would ideally take contributions from those who troll gaming rumor boards and web sites. (I would love to see people start contributing!) I also created a calendar to track when NYC Marathon qualifier races are, as there are many of us who aren't interested in the non-qualifier races. I try to keep the calendar fairly up-to-date myself, but if I fall behind, hopefully another calendar subscriber will notice and pick up the slack! 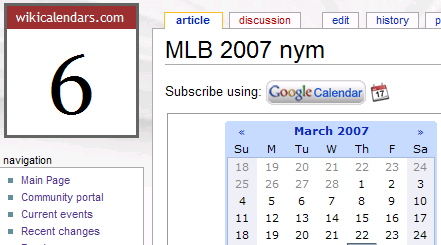 Which brings me to why I decided to store the MLB calendars on wikicalendars.com: though the schedule data is correct now, the baseball season is subject to rain outs and reschedulings, and I can't stay on top of all of those changes, but Time's Person of the Year can! This is, in many ways, an experiment. Will anyone keep these calendars up to date? Will they lie dormant and become inaccurate, or even worse, become littered with spam? I guess we'll see!